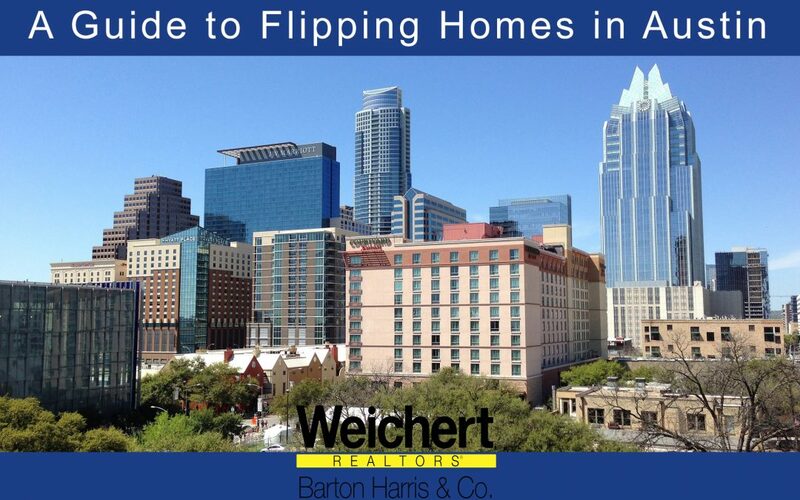 Guide to flipping homes Austin - Weichert, Realtors® - Barton Harris & Co.
House flipping has been steadily increasing as a popular way to make money off of property. Prevalent T.V. shows like Property Brothers and Fixer Upper have fanned the flames of this trend. But these shows can be misleading about how much work and expertise it takes to flip (and sell) a home for a return on investment that is worth the time and energy. According to a report by Attom Data Solutions, Austin is one of the more difficult large cities to pull this off. Profits from flipping homes in Austin are typically below the national average with an ROI of 26%. Most house flips take at least 200 days in Austin. There are many reasons why it’s difficult to flip homes in Austin. The most prevalent being that homes are being purchased in under 30 days on average. The rate of homes flying off the market makes it hard to get a home at its market value, let alone below market value. Home prices in Austin are steadily creeping up. An influx of new people moving to Austin is producing a steady stream of people that are looking to buy and don’t know what a house in Austin is actually worth so they often over-pay. Flipping homes in Austin is not a get rich quick scheme. It takes time, planning and expertise. If you have never purchased a home, don’t know the Austin market, don’t know how to do the construction work necessary to clean a home up, either don’t get in to flipping homes or hire someone that knows what you don’t. Keep in mind that the people that are flipping homes on T.V. are experts in this field. They are realtors, home builders, designers that have been working in this industry for years. If you are looking to get in to flipping homes specifically in Austin here are some points to keep in mind. Do you have the skills necessary to flip a house? Do you know what you don’t know? Flipping a house requires many different skill sets including realtor, appraiser, contractors of all kinds, interior designer, etc. If you don’t possess a certain skill you are going to have to pay someone else for it, and that detracts from your ROI. Each house requires a different amount of work and it’s important to know what you are capable of and to be able to tell how much work a house needs. The real money in house flipping comes from sweat equity. If you’re handy with a hammer, enjoy installing hardwood floors, can hang drywall, roof a house and install a kitchen sink, you’ve got the skills to flip a house. Flipping a house requires buying a house. It also requires paying taxes and holding fees for the time that you are remodeling it as well as the remodeling costs. Before you attempt to tackle a large scale project like this make a list of what the costs will be as well as the realistic sales price. Will there be a return on investment? It is better to overestimate the cost to remodel and underestimate what you will sell the house for. Keep in mind that if you don’t have cash readily available you will most likely be taking out a loan. You can’t get a loan without good credit. Ideally, you want to be working with cash because then you won’t be paying interest. Also be realistic about the timeline. As stated earlier it is taking on average around 220 days to flip a home in Austin. Is this timeline something you can financially afford? Austin also has fees due to laws regarding flipping homes so many investors are holding on to homes longer to avoid these additional fees. Ideally, the perfect house to flip is one that is being sold under pressure by the owner so they forgo some equity in order to make a quick sale. The chances of getting a home undervalued in Austin are very slim. This ideal home should have only cosmetic issues. Adding curb appeal, changing the colors of the walls, flooring and buying new appliances are all easy fixes. Homes with foundation, plumbing or mold issues should be avoided because these issue can quickly increase the cost of a remodel. Vacated and foreclosed homes are a good option in Austin because the owners/banks will be more interested to sell. Cash offers are very appealing to sellers so making this kind of offer can help you save money on the purchase in the long run. Plan the design of the remodel ahead of time. This way you can pre-order items like cabinets, finishes and hardware ahead of time. This saves you time waiting for things to arrive. Know the order in which items go in to the house. Clearly you can’t paint walls if dry wall needs to be put up but things like choosing the lighting before putting up drywall is less obvious. Knowing the different materials available can also make a huge difference in expenses. You could remodel a great house but if you don’t know how to market it, it won’t sell. Bad photos can make the most beautiful house look dark and small. If you aren’t a professional photographer, hire one. Keep in mind when designing the home that it’s not your house. Don’t personalize it too much and stick to what is popular. You want people to be able to picture themselves living their when touring and it can be difficult if you made the outside of the house your favorite shade of pink. Utilize free channels for marketing like social media. Don’t underestimate the value of staging the home. An empty home seems lonely. Austin has a wide variety of style of homes available and each style requires a different approach when remodeling. Queen Anne: These homes are pre and early 20th century homes. They can be found in many different areas but are very prevalent in the Hyde Park area. They are marked by Victorian towers, prominent gables, asymmetrical facades and candy colored exterior. Many have wrap around porches and are the oldest style of home in Austin. Because many are 100 years old they are considered historic monuments and have limitations to what can be remodeled. Craftsman: These homes are late 19th century homes that took a more simplified approach to the Queen Anne homes. They also tend to have gables and large porches. However the interior was drastically simplified with a more open layout. Bungalow: Bungalows are very popular in Austin especially in the older areas of central Austin. These homes were early 20th century homes and have two subsets; American Craftsman Bungalow and California Bungalow. They are traditionally one or one and a half stories with a porch or verandah and extended eves or an overhang. Spanish and Mediterranean Style: These homes are easily spotted by the red clay tile roofs and white exterior. These homes are from 19th century immigrants. Mid-Century: These homes are from post-war middle 1900’s. They vary in their appearance but are popular homes for remodeling. It is common to convert the garages in to more common living space. They are ranch style homes with open layouts. Contemporary: These are the homes from the 21st century currently popular. They are open and airy designs and feature environmentally friendly building materials. Because these homes are so new they typically aren’t good for flipping. We’ve all heard the mantra “Location, Location, Location.” That’s for a reason. The location of your remodeled home can greatly vary the selling price. There are neighborhoods in Austin that are the best for flipping homes right now. Deep East Austin, 78721: This area is great for remodeling because a lot of the homes are older and haven’t been well maintained or updated. It can be easy to find homes in the low 200s to flip and sell for 400K. This is a great area for young professionals and students to live. Crestview, 78757: This area is great for families. There are a lot of homes that need a makeover. Homes in this area sell quickly but aren’t super over-valued yet. There are lots of trendy restaurants in this area and is one of the hottest areas to move right now. University Hills, 78723: This area is adjacent to Windsor but doesn’t quite has the housing list prices as Windsor yet. Now is the time to buy and flip in this area before market prices rise. This is also one of the hottest areas to move in Austin right now. Northloop: This area has a lot of bungalow and mid-century style homes in desperate need of renovation. This area is currently listed as less than the average listing price in Austin at under $300K. It’s also developing quickly with introductions of trendy restaurants like Home Slice. A very family friendly area as well. There are a lot of scams out there regarding real estate flipping. On one end there are all the “GET RICH QUICK” seminars regarding house flipping. That’s just not the case in Austin. Most house flippers in Austin are financially motivated but also do it out of love for the city. Austin is not the best market for house flipping. There’s also contractors that will try to scam you. If they ask for more than 15% of the money up front that is suspicious. Most importantly, tour a property before you buy. If the person selling doesn’t have access to the property it’s a scam. Never wire money to people you haven’t verified. You can prevent all kinds of scams by purchasing insurance. Avoid realtors that say they’ll buy the house if they don’t sell it. This is just a way to get new clients and if they do actually give you an offer it will be well below market value. House flipping requires a lot of negotiation starting with getting the house. The cheaper you purchase the home you want to flip the greater chance you have for a larger profit margin. There’s also negotiation involved with contractors, realtors, buyers, etc. You can even negotiate the building materials and finishes. The more you fight for lower expenses the greater you ROI can be. If you aren’t comfortable talking to people about money, managing a team or getting your hands dirty in a remodel than flipping a house isn’t for you. One of the most powerful aspects of negotiation is patience. Now since you will be flipping a home there is a sense of urgency because the idea is to quickly sell the home. But don’t shoot yourself in the foot by moving the project along too quickly resulting in a poorly constructed remodel that no one is going to want to call home. The reality is that if you don’t know what you are doing you may end up losing money or get stuck with two mortgages. The first step to determining if you are up for this is determining what the project will cost and how much you could potentially lose if the project doesn’t go exactly as planned. The 70% rule is one way to determine how much you should pay for a home. The rule is you should pay no more than 70% of the after repair value (ARV) of a property minus the cost of the repairs needed. You should assess every repair you make to the house as an investment and consider whether or not you will get your money back. Will putting those top of the line appliances in the kitchen pay off? Thank you for reading our real estate and homeowners’ blog. We are Weichert Realtors – Barton Harris & Co. and we’re happy to have helped you with our guide to flipping homes in Austin.